"Death Note" (written by Tsugumi Ohba and illustrated by Takeshi Obata) gained popularity when it was serialized in Weekly Shonen Jump (Shueisha) between 2003 and 2006. This summer, the manga was turned into a television drama and broadcast on Nippon TV (Sundays at 10:30pm). Death Note was developed in a wide range of media, including movies, anime, and stage play, but this was the first serial drama. Death Note was turned into a live-action movie released in two parts and attracted much attention in 2006. The current television program features a different cast from that used in the anime and movies, first-time live-action characters, as well as an original story with new developments and ending, making it hotly anticipated among new summer dramas. The series got off to a good start with its first episode, broadcast on July 5th, attracting a high television rating of 16.9% (according to Video Research Ltd., Kanto Region). It was also broadcast in over 120 countries around the world and over the internet. Digital Frontier (hereinafter DF) played a large role in the 2006 movie, as well as the production of the current television program in compositing live-action shots and 3DCGI characters for the Shinigami and is credited with "Shinigami CG." After CGI production in the movie, what kind of reforms had to be made to the production environment in CGI production in the television program? 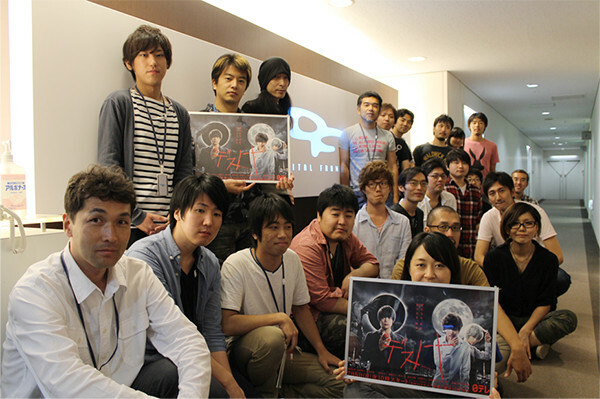 We talked to the director of GC Production Division, Yusaku Toyoshima, and producer, Nobuhiro Suzuki, about how they became involved in CG production in the serial television drama, "Death Note." We talked about CG production in a program in April. The whole thing started when the drama team from Nippon TV and the movie team came and discussed doing a television drama together using our experience with the movie. Initially, the director said that he "wanted 50 cuts per episode." We had some experience with CG production in a drama, but because this drama had full CG characters that appeared in every episode, we initially thought that it would be impossible be ready for the July quarterly season based on the volume of work. We didn't know about the differences between the pace of movie and television filming. How many cuts we could make in a one-hour program and how much processing would have to be done were aspects that, though we had experience with television programs, were "unknown territory." What was the decisive factor in getting through the unanticipated number of cuts in a restricted time period? When we went into it, we were given no more than 1 week of work time per episode. To explain the process simply, first, offline footage comes in and we work on Shinigami movement in the motion capture studio while watching the footage. Then, animators work on the CG characters while fixing the animation. And then, all this is composited with the real video images. One week passes between the time the offline footage comes in and the time DF delivers. We thought that this timeline would be close to impossible in terms of our typical workflow no matter how much of the movie asset data we could reuse. Measures were considered to overcome significant hurdles created by short delivery times, enormous number of cuts, and limited resources and budget. A proposal to try real-time rendering in order to reduce the number of work processes and time floated around. A number of tools were proposed and considered. We decided to try the real-time game engine, "Unreal Engine 4*1" (hereinafter Unreal). Accelerating rendering by using a game engine to meet the rate of television program production was an unorthodox choice. It wouldn't be an exaggeration to say that compositing CG created by a game engine with regular pictures in television dramas was unprecedented, even on a world-wide scale. We created test footage to see what would happen if we applied Unreal using singe-cut scenes from the movie. The process was simpler than we had feared and the quality was perfect. That's when we decided to use Unreal. There was no turning back at that point in time, so it was a bold decision. Incidentally, two Shinigami appeared already in the second episode and started to overlap. This episode featured many scenes in which Ryuk played a supporting role and conversations with the star were the highlight. The number of cuts inevitably increased in order to bring the story to life. I think we will exceed 400 cuts by the final episode based on our progress up to this point. The opportunity to have CG characters at the level of supporting characters in a television drama such as this one came about 10 years after the movie, and we were able to use Unreal as a solution to realize this without royalties if using it for video. When I think of it now, looking at the amount of material, the only options we had were giving up CG and going with full-body suits and special effects makeup, or, if the decision was to go with CG, introducing a real-time engine.